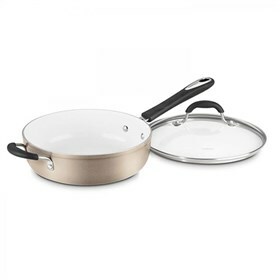 The Cuisinart 5933-30HCH aluminum saute pan has flat bottom which performs all the functions of a skillet, and has taller straight sides which maximizes its capacity. The cookware's riveted stainless-steel handle stays cool on the stovetop, while its lid seals in moisture and nutrients for healthier, more flavorful results. The 5.5 Qt Saute Pan W/Helper Cover Elements Nonstick Champagne has many exciting features for users of all types. See the 5.5 Qt Saute Pan W/Helper Cover Elements Nonstick Champagne product video above for more details. The 5.5 Qt Saute Pan W/Helper Cover Elements Nonstick Champagne is sold as a Brand New Unopened Item.